** Hey, all there were some errors in the post which I fixed on 1/1/12. The sizing on the PDF and on the post didn’t match. I thought the PDF was correct, but after going back and doing some measuring it was not. I have fixed it. 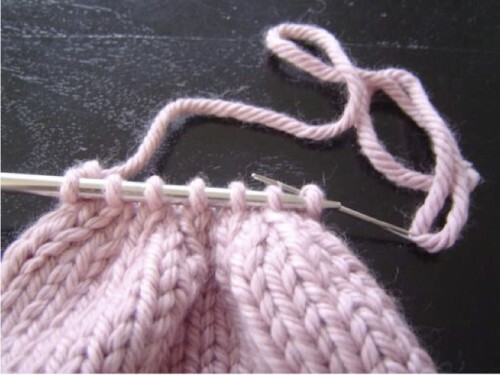 The correct measurements should have you knitting 5 inches (size 5), 5.5 inches (size 6), 6 inches (size 7), 6.5 inches (size 8), 7 inches (size 9). Thanks for understanding. Christmas is less than two weeks away, but there is still plenty of time make a thoughtful homemade gift like these knit mary jane slippers. Knit in bulky yarn, these slippers work up quickly and are easy enough for even beginning knitters. You only need one ball of yarn to make them, so spurge on a luxurious cashmere blend when making them for someone special (though they looks just a good in a less expensive yarn, like the Lion Brand Jiffy I used, too). The buttons on the straps are decorative which means you can use any fun ones you want. Know someone who always has cold toes? Throw these in their stocking. Have someone on your list who travels a lot? A pair of these fits in their purse to slide on while flying. Or just make a pair for yourself for relaxing in front of the fire. Repeat rows 1 and 2 for 5 inches (size 5), 5.5 inches (size 6), 6 inches (size 7), 6.5 inches (size 8), 7 inches (size 9). 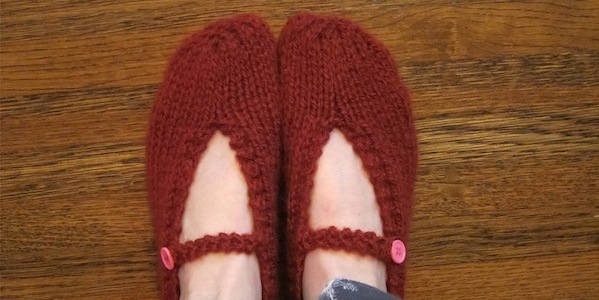 (If you are a half size you probably want to make the smaller size slipper as these do stretch.) Make sure to measure the stockinette portion not the garter stitch edge as the garter stitch actually pulls up tighter like a ribbing. Work 2 more inches in stockinette stitch (you are not doing the knit stitches at the ends of the purl rows anymore) ending with a purl row. Cut your yarn leaving about a 10 inch tail. Thread the tail on your tapestry needle. Starting with the stitch furthest away from the tail weave the tail through all the stitches on the needle creating a circle. Take the stitches off the needle and pull tight. Using the tail from the toe sew the two side together until you reach the garter stitch border. Weave in your tail. Fold your cast on edge in half & sew that together for the heel. Pick up 2 stitches from the edge of the right side of the slipper at the middle point. Knit every row for 3 inches. Bind off. Sew this end to the matching spot on the left side of the slipper. Sew on a decorative button if you wish. 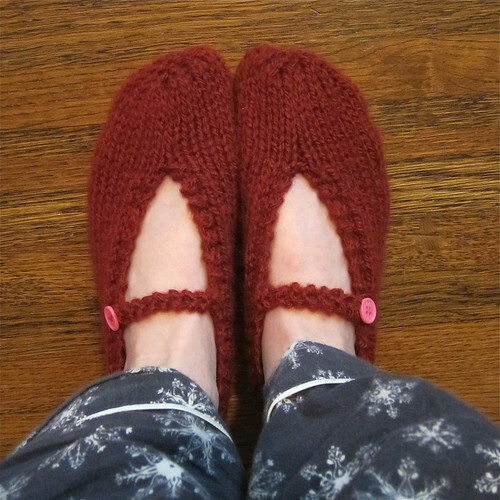 Repeat for the other slipper but pick up the stitches from the left side & sew onto the right. Weave in ends. If you make a pair of slippers we’d love to see then in our Flickr group! If you find any errors in this pattern please let me know so I can fix it. 7 years ago by Kat in Knitting , Knitting Projects , Needlecraft | You can follow any responses to this entry through the RSS feed. You can leave a response, or trackback from your own site. I love this! And my knitting skills are not that advanced, so I’m so excited to see such a cute project that only requires straight needles and techniques that I actually know. I printed the PDF and pinned this on Pinterest, and now it’s time for me to dive into my yarn stash and get started. Thanks for posting this. THis is SO cool I cannot wait to try it out!! I am just a beginner Knitter so this is amazing! Hi, I decided to make these with a slight variation. I just wanted to point out I think you meant cast on 28 stitches rather than inches and the sizing info after you repeat rows 1 and 2 doesn’t match between your post and the pdf version. Thanks for posting this though! Kim – Thanks so much for catching that! The sizing on the PDF was incorrect, so I have fixed it here and changed the cast on from inches to stitches. I love this slipper. However, I would like to make them out of wool and felt them. Can you give me some ideas as to what size needle I should use? I am thinking I could use this same pattern but use larger needles and then wash to felt. I myself have large feet, but would like to try making some for children also — especially my two little granddaughters — one wears size 13 (but will probably bigger by next winter) and the other wears a 3. Any help you could give me would be appreciated. Thanks! It is very hard to give you an answer for this question, because all yarns felt differently. If I was going to do it, I would knit up a few swatches of the yarn with different size needles and then felt the swatches. That way you would be able to tell how much the yarn felts & which size needle worked best. Since I have never felted this pattern, I can’t really give you any specifics. Do any of you readers have any thoughts on this? Thinking about it now i should knit for 7.5 inches….silly me! Thanks anyway! I love this pattern but I would like to make it using leftover yarn from the many scarf and hat sets I have been making. The problem is – – – I only have (4) Worsted Weight yarn. Do know how many stitches I should use to get the same measurement as you get with the (5) Bulky Weight? 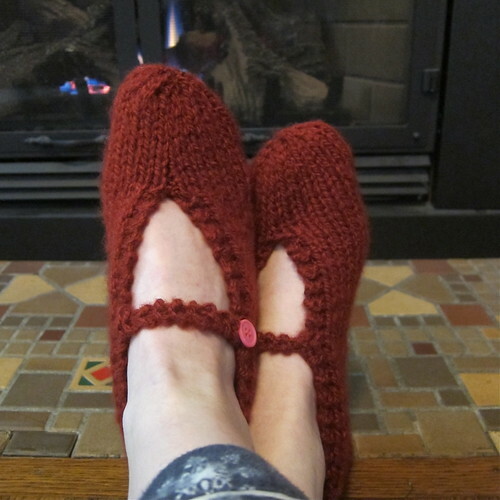 Or – Do you have a pattern for the Mary Jane style slipper using (4) Worsted Weight yarn? Thanks for the pattern and (in advance) for any suggestions you may Have for me. This pattern is darling! I just adore it!! Cannot wait to whip up some for Chris,tad gifts! I was wondering though, if these were done in Worsted Weight, how would YOU knit them to make them measure up the same? I know a smaller needle would help them be tighter too. Any help is much appreciated. Thanks again for this post!! Looooove it! To do these in different weight wool would be all about doing the math, so my gauge was 3.5 stitches per inch and I cast on 28 stitches. If you divide 28 by 3.5 you get 8 which is the width of the fabric for the slippers. So you will need to do a gauge swatch and find your gauge. Multiply your gauge by 8 to find out the number of stitches you need to cast on. You would do the length as required for your size in the pattern, that doesn’t change. You may want to add another two rows to the toe shaping. Also you may want to pick more stitches for the strap. Love this pattern and cant wait to get started on it. Just wanted to double check… the shoe sizes you are using, are these US sizes? Yes, these are in US shoe sizes. It says you need about 100 yards. Im assuming thats for both slippers. But it says bulky yarn, how much yarn do you think you would need if using super bulky yarn? Oh gosh, really have no good way to tell you since I haven’t used super bulky to knit these. 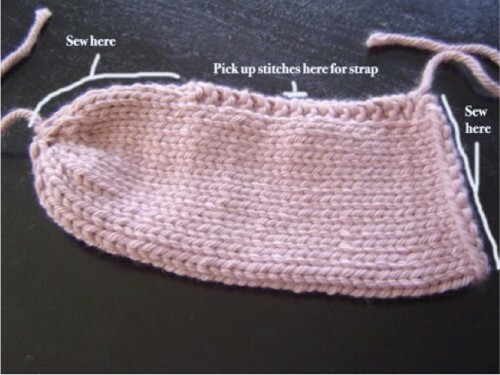 I’m guessing it might be a little less, but also keep in mind if you are not knitting to the same gauge of 3.5 stitches per inch you will get a different fit. I didnt expect anyone to even answer, let alone so quick since im so late to find this. We try to answer as much as we can! This pattern is brilliant! I made a pair today and I love them!!! Thanks so much for sharing! Thank you, I’m glad you like them. I think they are the perfect little Christmas gift too.